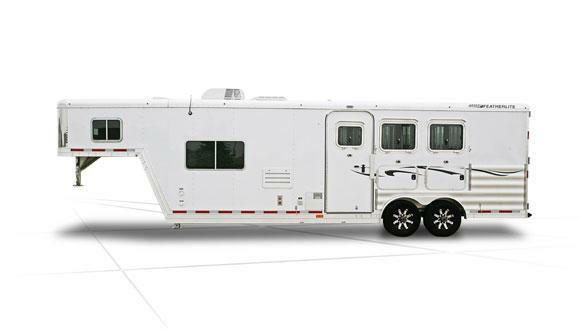 The Featherlite Model 8581 horse trailer living quarters may make your horse wish it walked on two legs. Thanks to Featherlite's partnership with Sierra Interiors, all the comforts of home can go into our horse trailers' living quarters from microwave ovens to flat screen TVs. If that isn't enough to make you want to live out of your horse trailer, we also offer countless options on appliances, upholstery, cabinets and much more. Live in luxury wherever you travel in Featherlite's Model 8581! And be sure to check out the Featherlite Country Estate luxury horse trailer! Trailer Length: Ranges from 15' 0" to 40' 9"
Weight: For the weight of this particular model, please download and reference Trailer Weight Index for Model 8581. While the Featherlite Model 8581 is a slant load horse trailer that can be configured to hold 2 to 6 horses, its biggest draw is its living quarters area. The trailer measures 8' wide with unlimited horse area/living quarters size configurations from 4' to 25'. The horse area contains 3/4" thick rubber mats on the floor with rubber on the bottom half of the walls.